I was able to get pics of 4 of our crew of 5 on a sizing chart, but am having trouble interpreting the results. Anyone able to advise what size shells we need? I'm having a terrible time finding shells light enough for them to want to wear now that they aren't "babies" anymore. PS They do have access to approx. half a dozen of each PP preferred shell type recommended in the "shell guide". I am still new at this myself but what I did was got a vernier caliper. I measured mine the best I could with them in their shells. At first I was sizing up 1/4” bc I was thinking like shoe sizes. When I got my first couple shells I realized they were way too big, only go up 1/8”. You probably don’t need a measuring caliper but it eased my o.c.d. knowing I was getting exact measurements. Once you start buying shells it really gets easier, it just feels difficult thinking you might not be getting the correct sizes, at least for me anyway. I just started buying, measuring and letting them pick which ones they liked and went from there. The measurements from the painted “D” shaped shells were different than measuring the “O” shaped turbos. Get some that are smaller and some that are larger so they can go back and forth as they want to. Mine like the turbo shells and my “Salty” likes to go between 3 different shells and one of them is too small. I think she likes to change shells a lot because she has the options. Someone had said that they might not have the option of changing so often in the wild, so that’s why they do. You sound like you have a lot of shells for them to pick from so you may be able to just go up in size from what you have. I haven’t seen that sizing chart before, that’s pretty cool, I wish I would have when I started. Where did you get it? Someone with more experience may be able to help you better than I can, and with the sizing chart. I always measure across the shell opening at the widest area (inside to inside of the opening) the best I can. Then order several shells between 1/8" & 1/4" larger. As long as you are close with your measurements you should be fine with ordering up. 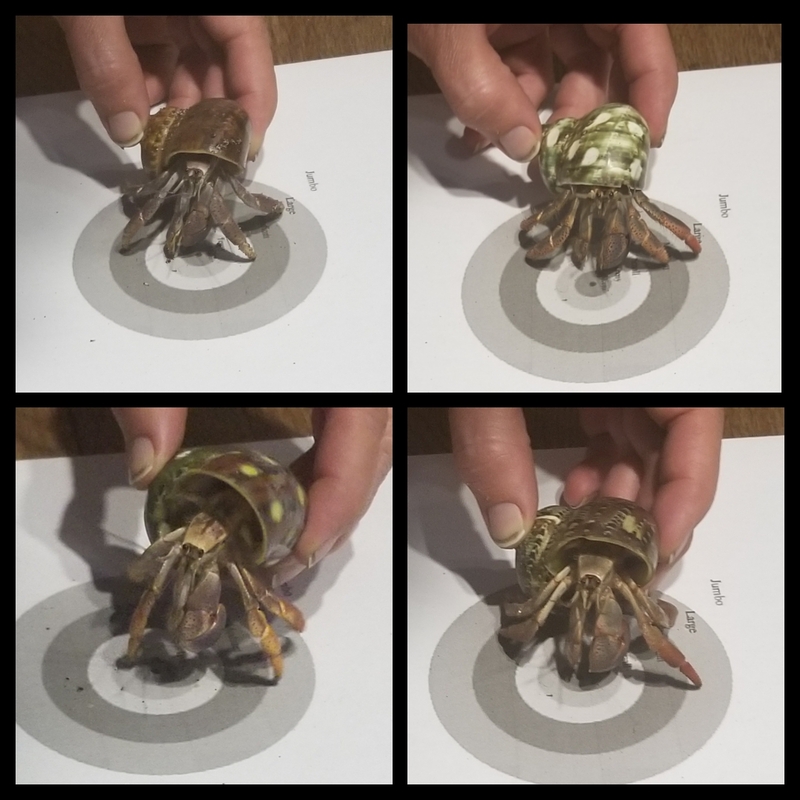 You can even take something like a quarter or a bottle cap and measure their diameter then put that against a shell opening to judge the openings. If it goes into the shell you know the opening is bigger. That works much better if the shell doesn't have a tennant though. The shell sizing chart on here actually works pretty well once you figure it out. It helps ordering shells if the shell size is called out but opening sizes aren't. Great for buying on Etsy or eBay. Find the type of shell and opening size. Go straight up to the black line the over to the shell size. Since this is based on an overall average some openings may be average. The other colors above and below the black line represent where a percentage of the shell openings will range. Some crabs will go just a little larger and some will pick shells that you would think are way to big for them. That's why I think it is always good to get a few different shells of each size. Until now, i've been using a measuring tape to measure the shell they're currently in. Then i just give them some the same size and a little bigger.